The long awaited list of recommendations and potential regulations for robocars has just been released by the National Highway Traffic Safety Administration (NHTSA), the federal agency that regulates car safety and safety issues in car manufacture. Normally, NHTSA does not regulate car technology before it is released into the market, and the agency, while it says it is wary of slowing down this safety-increasing technology, has decided to do the unprecedented — and at a whopping 115 pages. Broadly, this is very much the wrong direction. Nobody — not Google, Uber, Ford, GM or certainly NHTSA — knows the precise form these cars will have when deployed. Almost surely something will change from our existing knowledge today. They know this but still wish to move. Some of the larger players have pushed for regulation. Big companies like certainty. They want to know what the rules will be before they invest. Startups thrive better in the chaos, making up rules as they go along. NHTSA hopes to define “best practices” but the best anybody can do in 2016 is lay down existing practices and conventional wisdom. The entirely new methods of providing safety that are yet to be invented won’t be in such a definition. The document is very detailed, so it will generate several blog posts of analysis. Here I present just initial reactions. Those reactions are broadly negative. This document is too detailed by an order of magnitude. Its regulations begin today, but fortunately, they are also accepting public comment. The scope of the document is so large, however, that it seems extremely unlikely that they would scale back this document to the level it should be at. As such, the progress of robocar development in the USA may be seriously negatively affected. The first part of the regulations is a proposed 15 point safety standard. It must be certified (by the vendor) that the car meets these standards. NHTSA wants the power, according to an Op-Ed by no less than President Obama, to be able to pull cars from the road that don’t meet these safety promises. As you might guess, the most disturbing is the last one. As I have written many times, the issue of ethical “trolley problems” where cars must decide between killing one person are another are a philosophy class tool, not a guide to real-world situations. Developers should spend as close to zero effort on these problems as possible since they are not common enough to warrant special attention. If not for our morbid fascination with machines making life or death decisions in hypothetical situations. Let the policymakers answer these questions if they want to; programmers and vendors don’t. For the past couple of years, this has been a game that’s kept people entertained and ethicists employed. The idea that government regulations might demand solutions to these problems before these cars can go on the road is appalling. If these regulations are written this way, we will delay saving lots of real lives in the interest of debating which highly hypothetical lives will be saved or harmed in ridiculously rare situations. 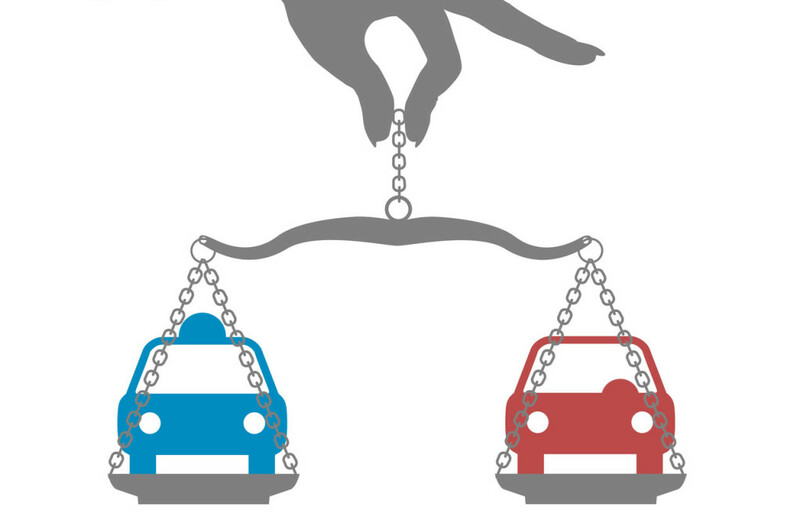 NHTSA’s rules demand that ethical decisions be “made consciously and intentionally.” Algorithms must be “transparent” and based on input from regulators, drivers, passengers and road users. While the section makes mention of machine learning techniques, it seems in the same breath to forbid them. data on the car’s perception system and how it handles every sort of failure. However, the requirement to keep the government constantly updated will be burdensome. Some vehicles will be adding streets to their route map literally ever day. While I have been a professional privacy advocate, and I do care about just how the privacy of car users is protected, I am frankly not that concerned during the pilot project phase about how well this is done. I do want a good regime — and even the ability to do anonymous taxi — so it’s perhaps not too bad to think about these things now, but I suspect these regulations will be fairly meaningless unless written in consultation with independent privacy advocates. The hard reality is that during the test phase, even a privacy advocate has to admit that the cars will need to make very extensive recordings of everything they can, so that any problems encountered can be studied and fixed and placed into the test suite. NHTSA’s plan has been partially endorsed by the self-driving coalition for safer streets (whose members include big players Ford, Google, Volvo, Uber and Lyft.) They like the fact that it has guidance for states on how to write their regulations, fearing that regulations may differ too much state to state. I have written that having 50 sets of rules may not be that bad an idea because jurisdictional competition can allow legal innovation and having software load new parameters as you drive over a border is not that hard. 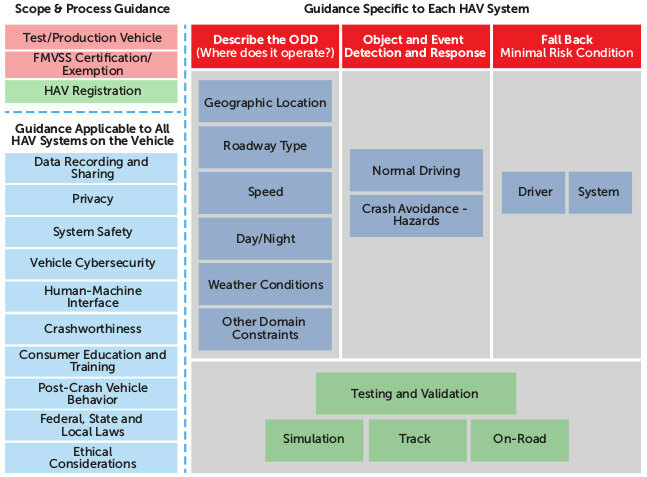 In this document, NHTSA asks the states to yield to the DOT on regulating robocar operation and performance. States should stick to registering cars, rules of the road, safety inspections and insurance. States will regulate human drivers as before, but the feds will regulate computer drivers. States will still regulate testing, in theory, but the test cars must comply with the federal regulations. A large part of the document just lists the legal justifications for NHTSA to regulate in this fashion and is primarily for policy wonks. Section 4, however, lists new authorities NHTSA is going to seek in order to do more regulation. NHTSA has abandoned their levels in favour of the SAE’s. The SAE’s were almost identical of course, with the addition of a “level 5” which is meaningless because it requires a vehicle that can drive literally everywhere, and there is not really a commercial reason to make a car at present that can do that. More analysis is on the way.